Safe Cracker Classic Slot Guide & Review - Casino Answers! 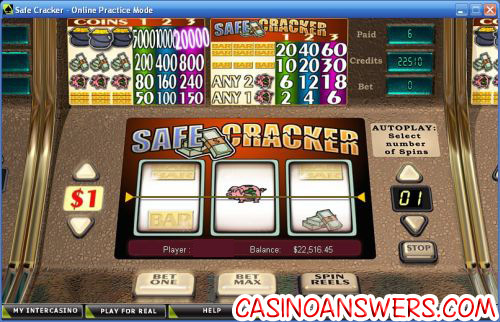 Safe Cracker is a 3-reel, 1-line classic slot machine developed by Cryptologic. You can play the Safe Cracker slot machine at VIP Casino and Casino Joy. Bets on the Safe Cracker slot machine are $0.01, $0.05, $0.10, $0.25, $1 $2 and $5. Use “Bet One” and “Bet Max” to play 1-3 coins per spin. The lowest total bet you can make on the Safe Cracker slot game is a penny per spin. The highest total bet is $15 per spin. Being a penny slot, Safe Cracker makes an excellent classic slot for casual players who want to win big without risking a lot of money. You can play multiple spins at a time by adjusting the arrows under “Autoplay” before you play. Hit the “Spin Reels” button when you’re ready to try and crack the safe. Crack the safe by hitting 3 Pot of Gold symbols to win the top jackpot of 20,000 coins! That is one of the highest top fixed jackpots around, perhaps the highest on any classic slot machine we have reviewed here on Casino Answers up to this point. Try and win the top jackpot now at VIP Casino! There are 8 winning combinations on the Safe Cracker slot machine. The full payout schedule is as follows (1/2/3 coin payouts in parenthesis): 1 Piggy Bank symbol (2/4/6), 2 Piggy Bank symbols (6/12/18), 3 Single Bar symbols (10/20/30), 3 Double Bar symbols (20/40/60), 3 Triple Bar symbols (50/100/150), 3 Piggy Bank symbols (80/160/240), 3 Cash symbols (200/400/800) and 3 Pot of Gold symbols (5000/1000/20,000). The top jackpot of 20,000 coins on the Safe Cracker classic slot game makes it definitely worth a few spins if you find yourself playing at VIP Casino! Are players from the United States able to play the Safe Cracker video slot? Unfortunately, Cryptologic online casinos are not accepting players from the United States of America at this time. However, American players can play a classic slot that is a lot like Safe Cracker called Bust-A-Vault at Cocoa Casino. Can I play a Flash game of Safe Cracker for free? While a free version of the Flash game is not available, you can play a real money version of the Safe Cracker slot at VIP Flash Casino and Casino Joy Flash Casino. If you experience any problems with the Flash slot game, try downloading and installing the latest version of Adobe Flash Player. Doesn’t the Safecracker slot machine have a progressive jackpot? There are two different “Safecracker” casino games. The one being reviewed here is found at Cryptologic casinos such as VIP Casino and does not have a progressive jackpot, but there is another one at Playtech online casinos like Bet365 Casino where you can win a progressive jackpot. Is there two safe cracker slots?